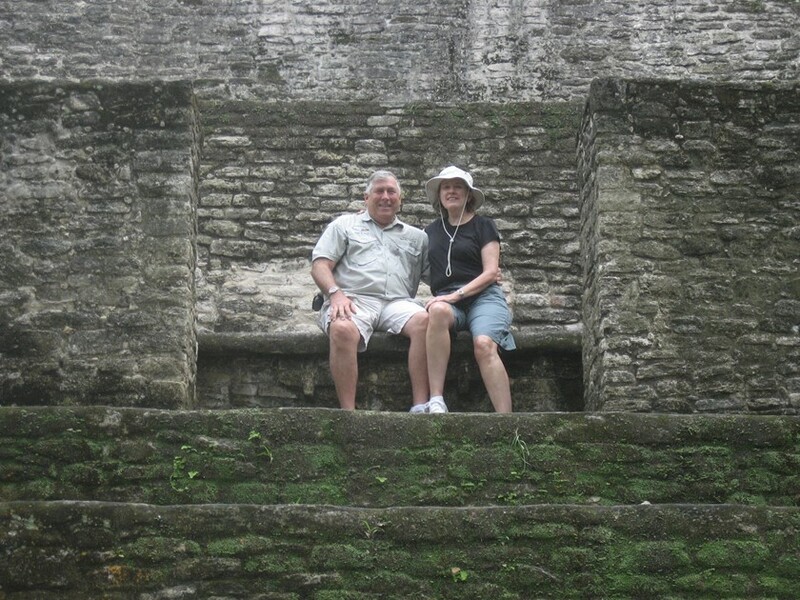 Neither of us had been to Belize before and it had been a long, challenging year since our last vacation. It was time. And from what we had heard from others, this was the place. 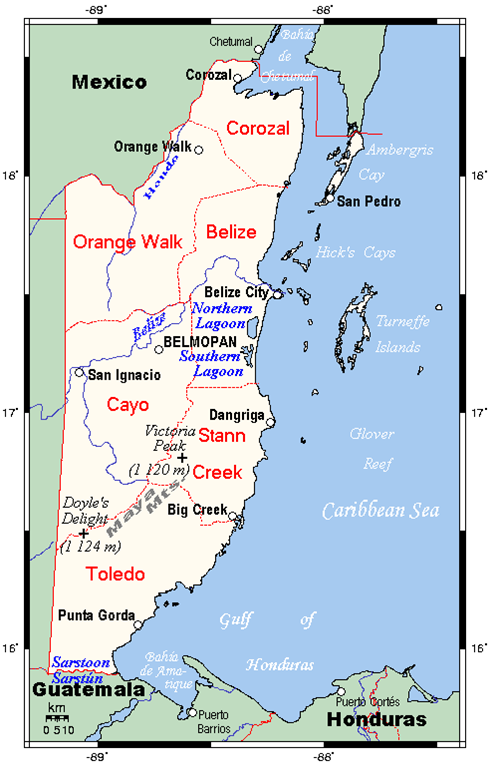 Belize is on the eastern coast of Central America on the Caribbean, just below Mexico and just east of Guatemala. 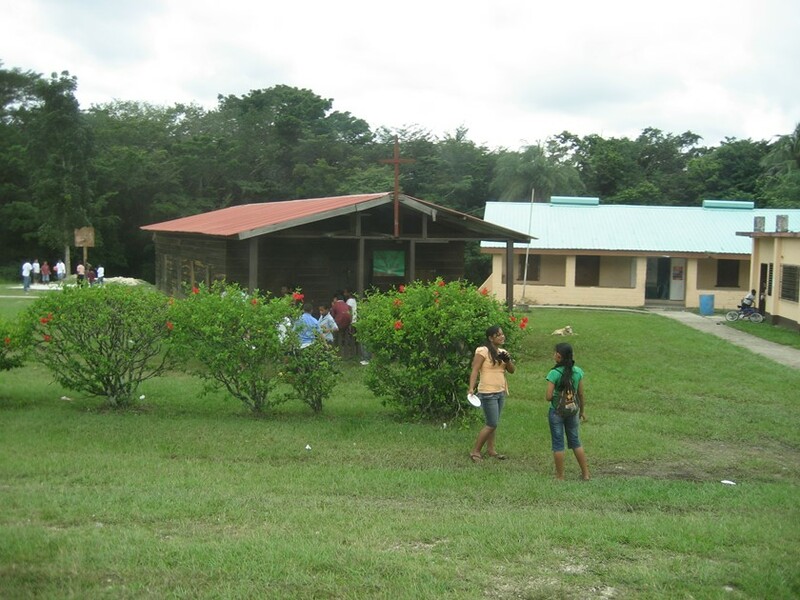 It was formerly called British Honduras but gained its independence on September 21, 1981. On Monday morning, we had to get up at 4:00am to make a 6:45 flight from O’Hare to Dallas-Ft. Worth. There we had a 3-hour layover until our flight left for Belize City. Unfortunately, the flight was delayed for an additional 45 minutes for a security check of the aircraft. 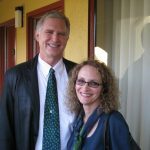 The flight to Belize was about 3 hours and was uneventful except for an unusually cheerful flight attendant whose name was Brad Norr. He made for a quite enjoyable flight. We landed in Belize City at about 4:30pm. Since we had carry-on bags, we went quickly through immigration and customs. 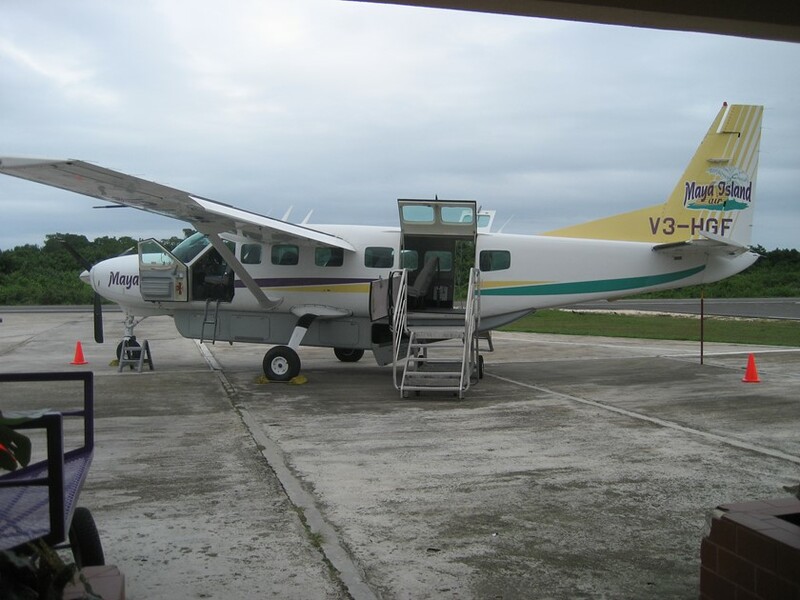 We had to catch a flight on a small commuter plane to our inland airport destination of Dangriga. We rushed to the check in counter. There we discovered we had only 5 minutes to catch the flight. Well, it turned out that our luggage, which had to be checked on the small plane, made the flight, but we didn’t. So we waited for about an hour for what turned out to be the last flight of the day. Day being the operative word, because night was falling. All 14 seats were occupied (12 without the pilot and copilot) and one of the fellow passengers said they had been told that this flight couldn’t go because they are not allowed to fly after dark. Well, being a pilot myself, I fly at night a lot and had never heard such a thing. 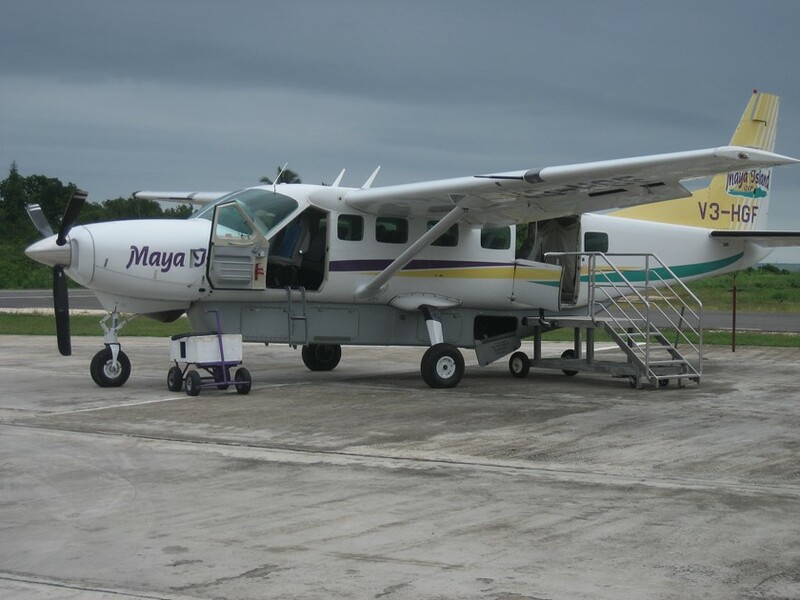 Finally, we took off from Belize City for the 20-minute flight to Dangriga. The sun had set and there was less than one-quarter moon. It gets dark quickly during those 15 minutes. As we approach our destination and the pilot began to descend, I couldn’t help but look out the front to try to find the runway. It wasn’t there. There were city lights off to the right, but no airport. He was descending into the middle of the jungle. There was no airport beacon. There were no runway lights. There was nothing to indicate that a plane could land in this jungle. Finally, at 300 feet above the ground I made out a darker than usual strip of darkness in an otherwise very dark jungle. There was NOTHING to indicate that this was, in fact, a runway. And, by now, it was a very dark night. The pilot, as one might expect, had clearly done this before and made a perfect landing on this nonexistent piece of payment. A U-turn at the end and we pulled up to a passenger terminal where baggage handlers were waiting. 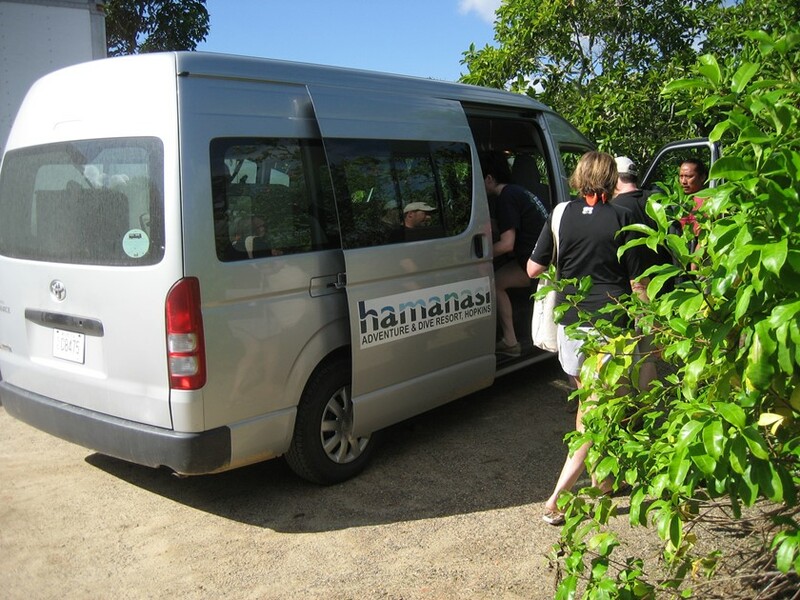 We were whisked into a waiting van along with two other couples for the 45-minute ride to the Hamanasi Adventure and Dive Resort. Well, this 45-minute ride turned out to be an adventure unto itself. We spent less than 20 minutes on paved roads. The rest was rutted dirt roads with speed bumps. Why they needed speed bumps is beyond me. 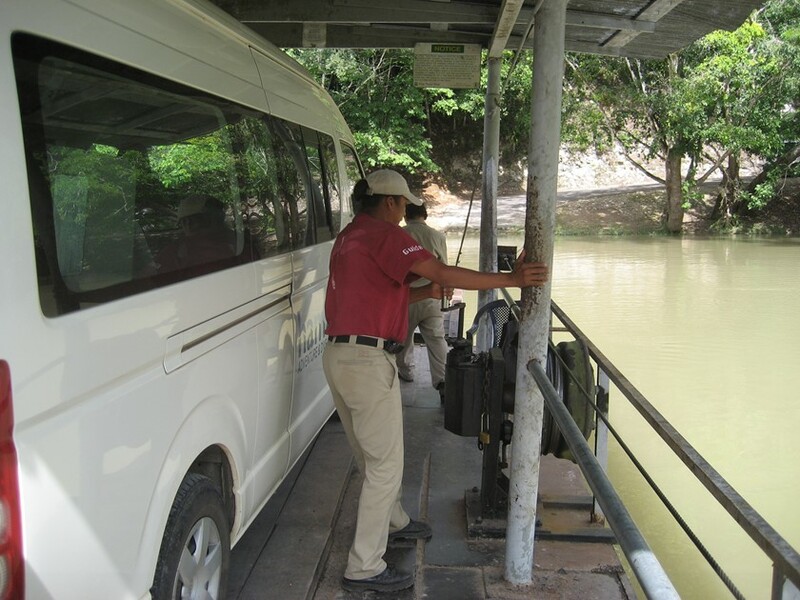 As we got close to the resort, the driver slowed to a crawl to cross pools of water up to our axles. He explained that there was a hard rain the night before and it would take a day or two for the road to return to normal – whatever that is. Finally, we arrived at the resort at about 7:00pm; a full 12 hours from our departure from O’Hare. There were about ½ dozen other guests enjoying happy hour as we arrived. 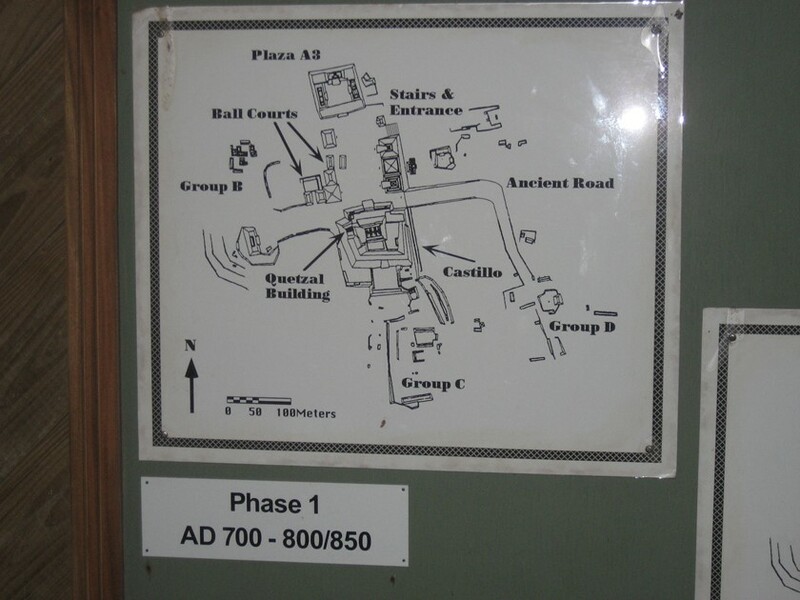 We got a quick briefing and were shown to our rooms. 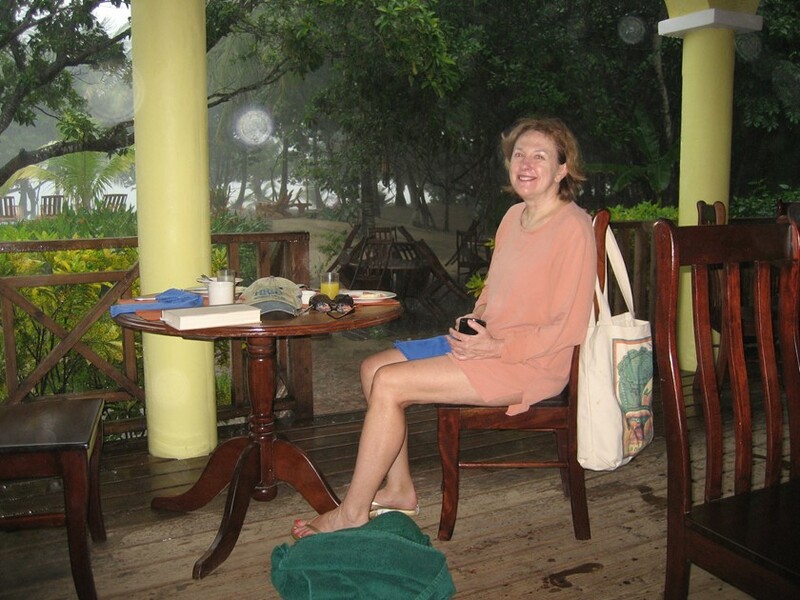 As we settled in and unpacked, the rains began again, pounding on the roof of our tree house. 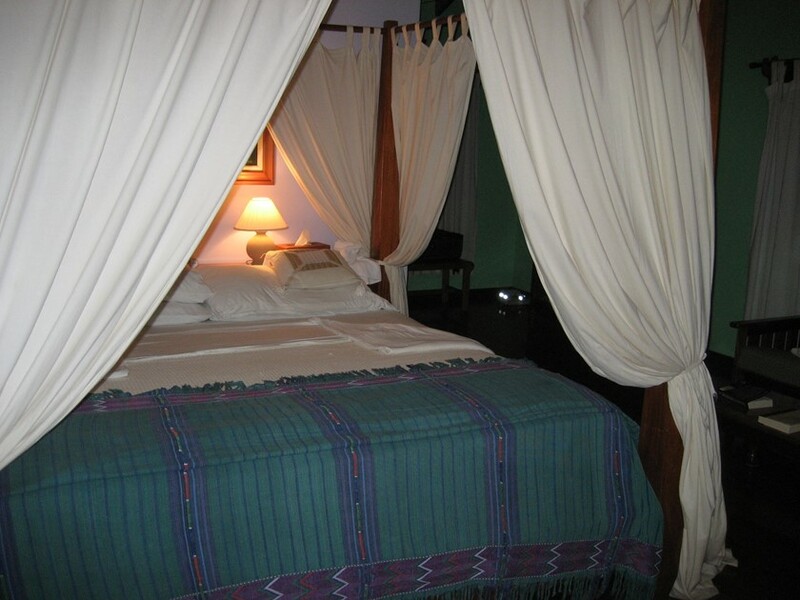 No worries, we were comfortable in a very nice room. 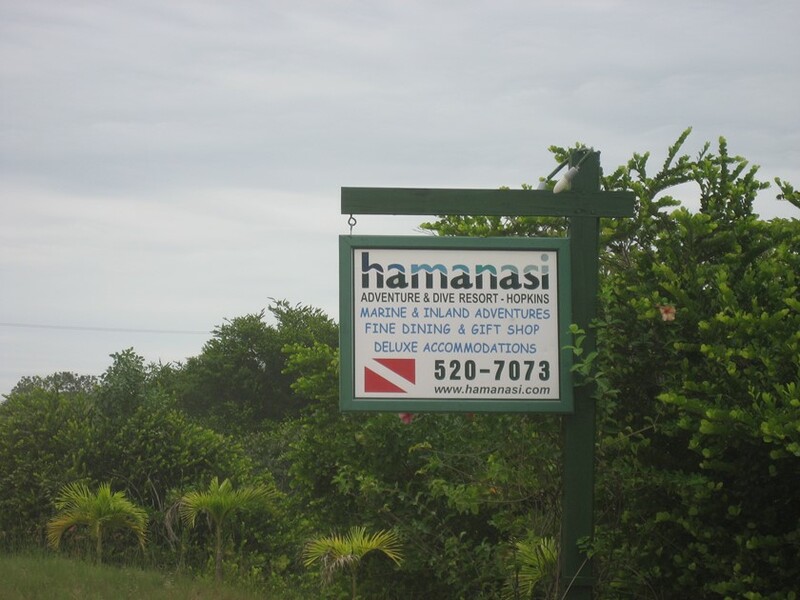 It made for a very long travel day when one awoke at 4 am in Chicago and finally arrived at Hamanasi Resort at 7 pm. We skipped dinner, read for a while and dozed off. We were told that the resort had wireless Internet access but, due to the hard rains, there had been problems with the hardware and it was not working. I thought to myself this was a fairly typical story for Central America and we probably wouldn’t see Internet access for the duration of our stay. But I was wrong. In a small lounge area beside the check in desk there was a man working on the computers and in the morning the Internet was up and working fine. Bright and early the wireless Internet was up and running. Unfortunately, it was raining. It rained hard for most of the morning. We just chilled out and read our books. We took a walk on the beach during one of the rain breaks. We had lunch in the restaurant, but it was still raining. By 1 pm the rain had stopped. 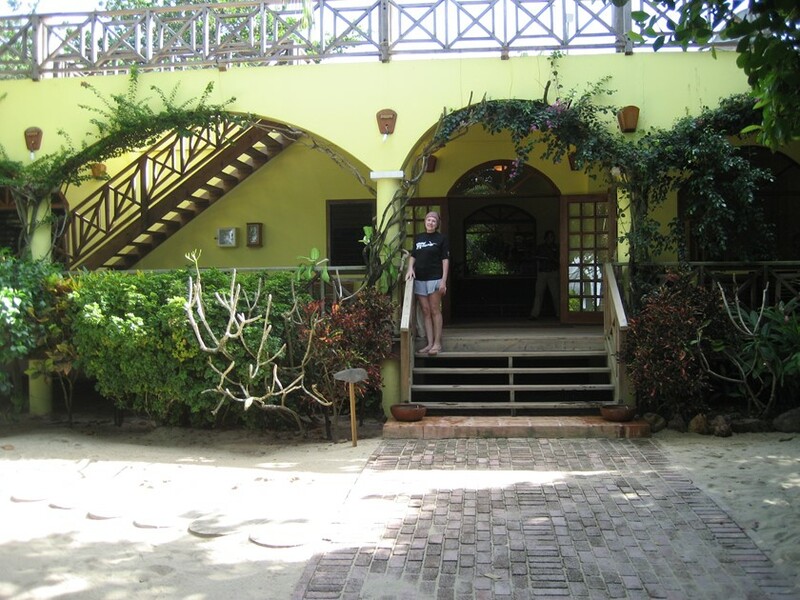 We swam in the Caribbean and then hung out by the pool to continue reading. By the end of the day, there wasn’t a cloud in the sky and it was sunny and hot. 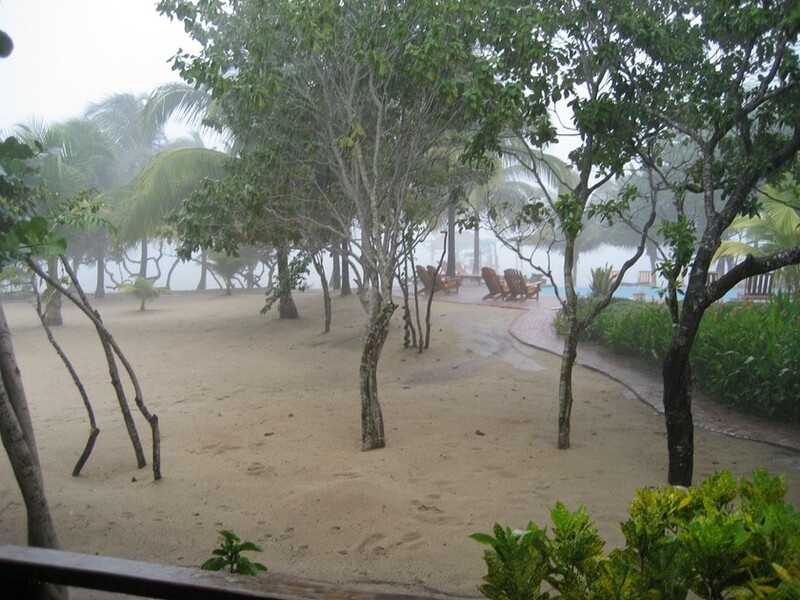 This was the morning we chose to go snorkeling. That meant an early breakfast and an 8:00 departure on the boat. Fortunately, it was a beautiful morning. Breakfast was always available from 6:30 am to 9:00 am and they always had good choices. We boarded the boat with the same couples with whom we had ridden from the airport plus two young women from a different resort. It took only 30 minutes to get to the snorkeling location but on the way we stopped at a small-uninhabited island to watch some of the mating habits of the Man O War bird. We snorkeled for about an hour during which we saw beautiful coral and fish. We also saw two stingrays and a manta ray. These were just so graceful and majestic as they slowly and calmly made their way beneath us. We then boarded the boat for a quick trip to a small island for a bathroom and refreshment break. About 30 minutes later we reboarded our boat and went to a different snorkeling location. This was another beautiful site. The sun was high and the clouds were few providing illumination for our swim. Again we saw a manta ray among all the other fish. A large ray is just such a graceful, elegant fish that it is a joy to watch. After 40 minutes or so we climbed back on the boat and held on for the 30-minute ride back to the hotel. During cocktail hour we got to know some of our fellow travelers better. Two of the couples had just gotten married and were on their honeymoon. This morning I got up early to go SCUBA diving while Pat slept in. The dive was a wall dive at the “Long Reef” location. The weather was nice, but cloudy and the water was less clear than usual. But, the dive was a lot of fun. We returned to the hotel at about 12:30 in time for a quick lunch before the afternoon activities involving a Kayak trip down the local river. 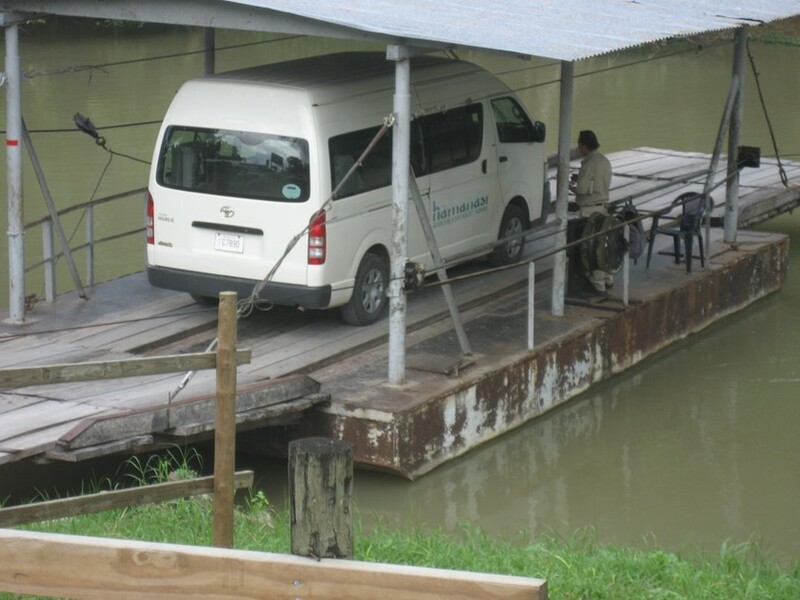 We boarded the Hamanasi van again but this time the ride was only 15 minutes to the entry point on the river. We were with the same three couples who had flown in from Belize City together and then endured the late night van ride to the hotel on Monday. We were enjoying getting to know each other. The trip was entirely downstream so the paddling was easy. 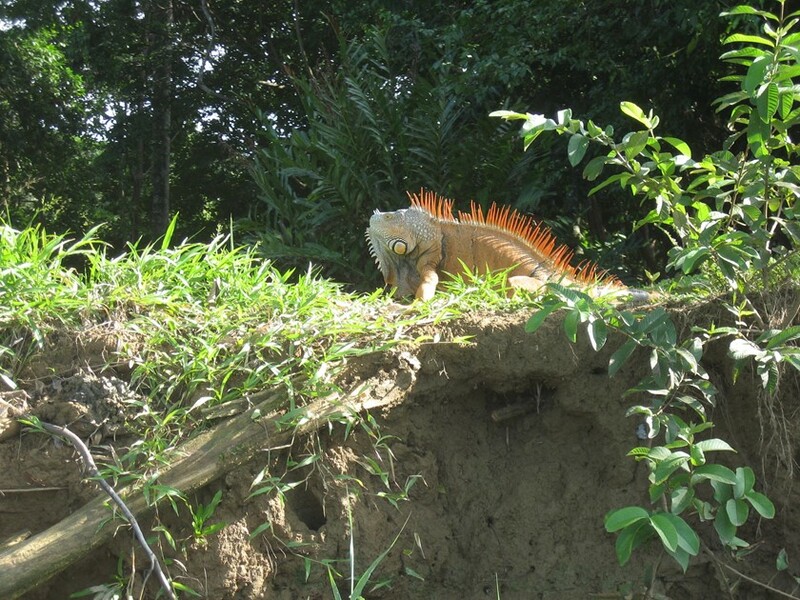 Along the way we stopped several times to see some very large male iguanas. 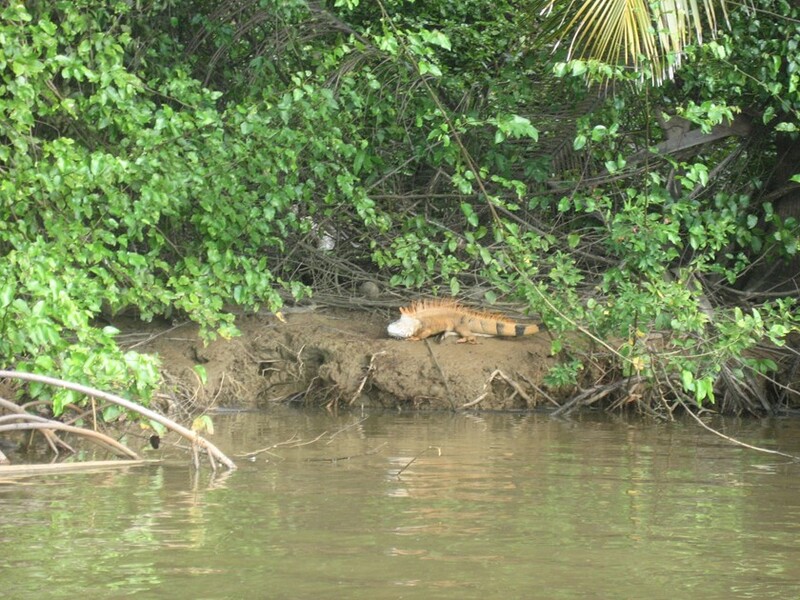 We had hoped to see a crocodile languishing in the river or a boa constrictor hanging on an overhead branch. Our guide carefully searched both banks for signs of either. Unfortunately, a large powerboat roared up the river and, we fear, scared away anything interesting. We returned to the hotel for happy hour. 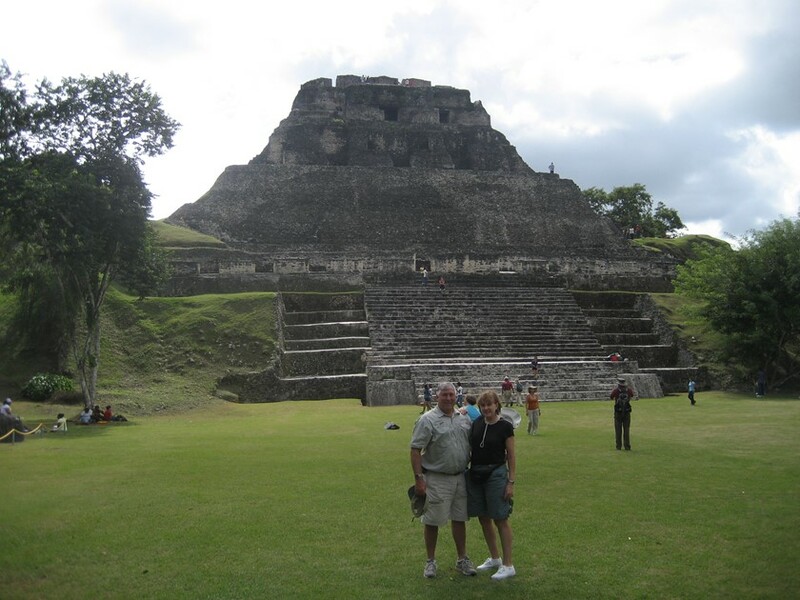 Today we signed up for a trip to the Mayan ruins near the boarder with Guatemala. We met at 7:30 am for a 2-½ hour van ride to the sight. The first 30 minutes were on the local dirt roads but the remainder was on paved highways. 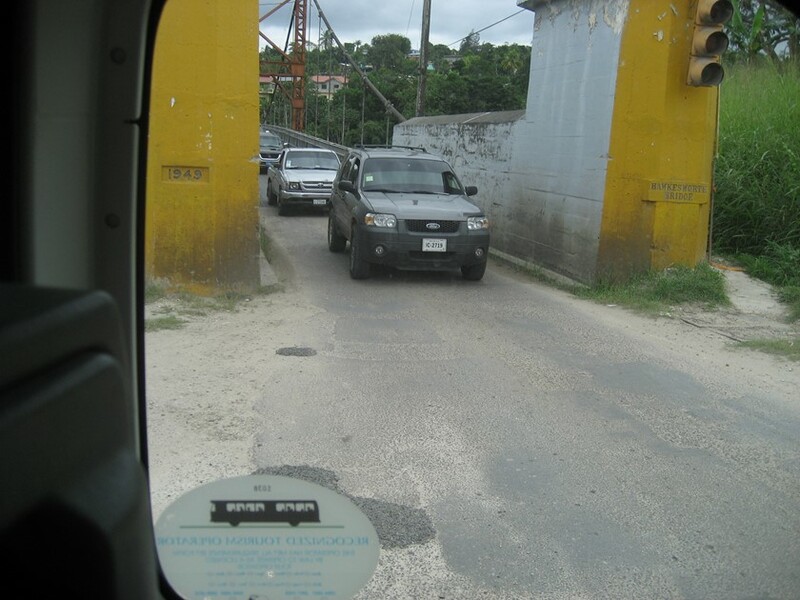 That said, the Belizean idea of a paved road is more akin to a hastily laid country road. The surface was not smooth. Along the way, we passed the CPBL Juice Depot. 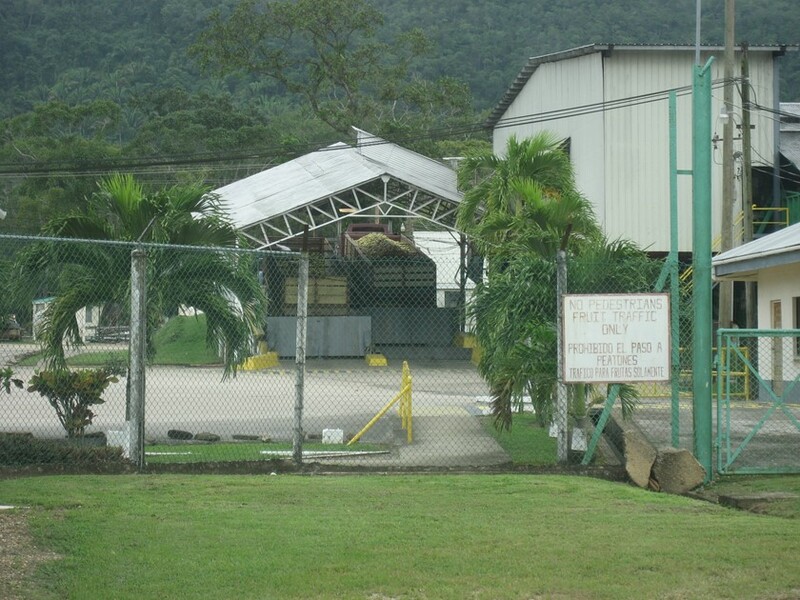 This was a large facility for collecting grapefruit for local consumption and export. Trucks and farm tractors were lined up at the gate to dump their loads. We passed many local schools and learned that education is not provided by the state but rather paid for by each family. We made the mandatory rest stop at a souvenir store. 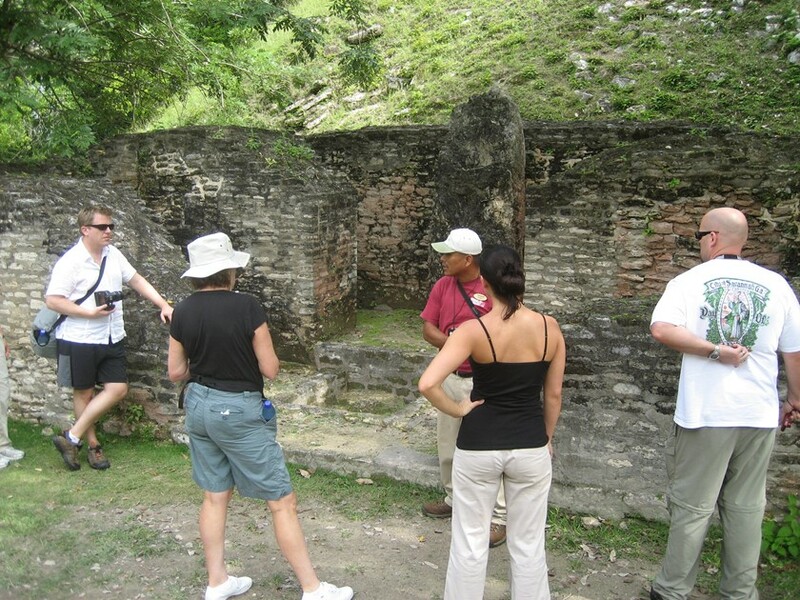 It was clear that the tour guides receive a portion of the amount spent as encouragement for them to bring us here. 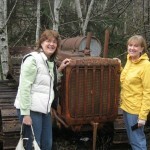 Most of our traveling companions found something of interest. We passed several one-lane bridges. To enter the park we first had to have our van and ourselves ferried across a river. 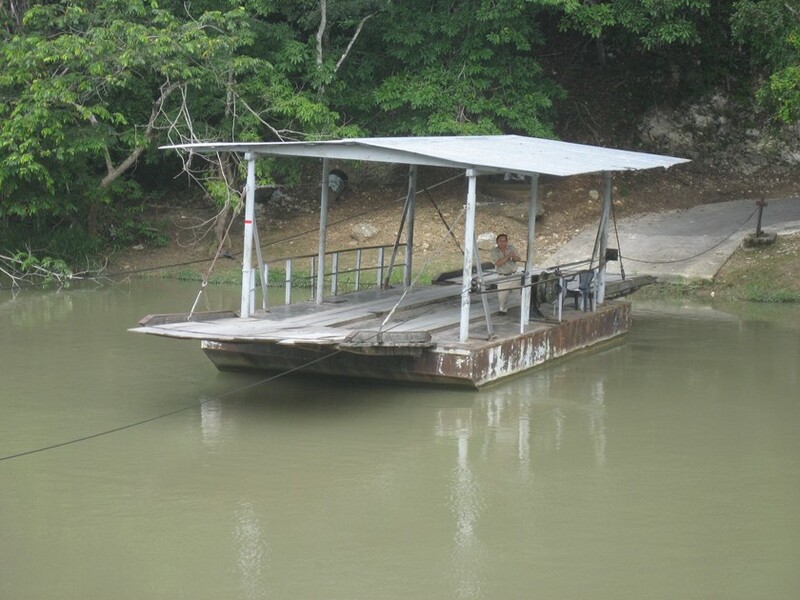 The power to move the ferry was provided by a hand-crank. 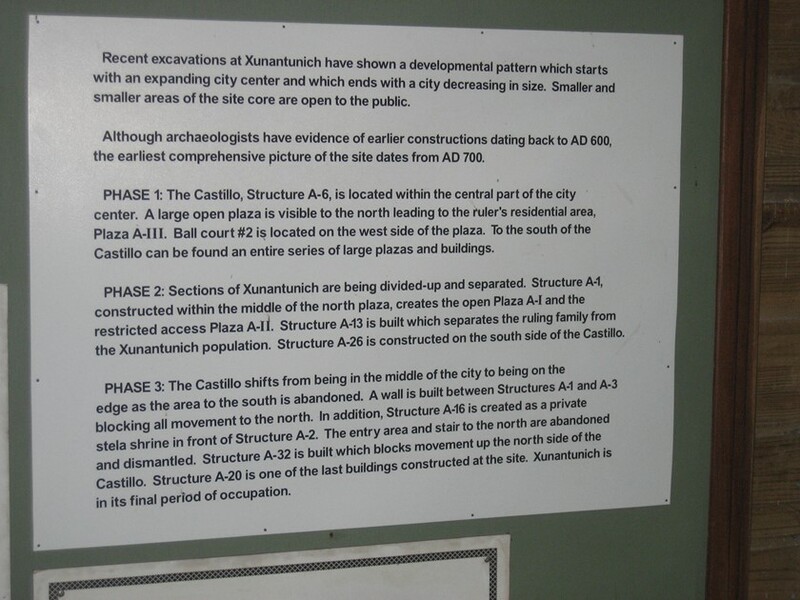 Finally, after 2-1/2 hours, we arrived at the Xunantunich site. 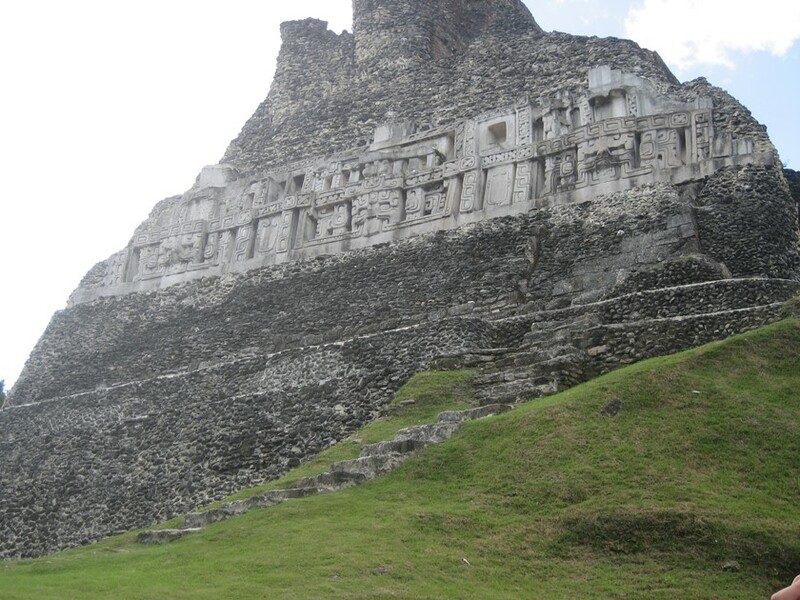 In the ancient Mayan language, Xunantunich means Stone Lady. As we walked up the hill to the main site, the first thing we passed was what used to be a kitchen for preparing and serving the royalty. 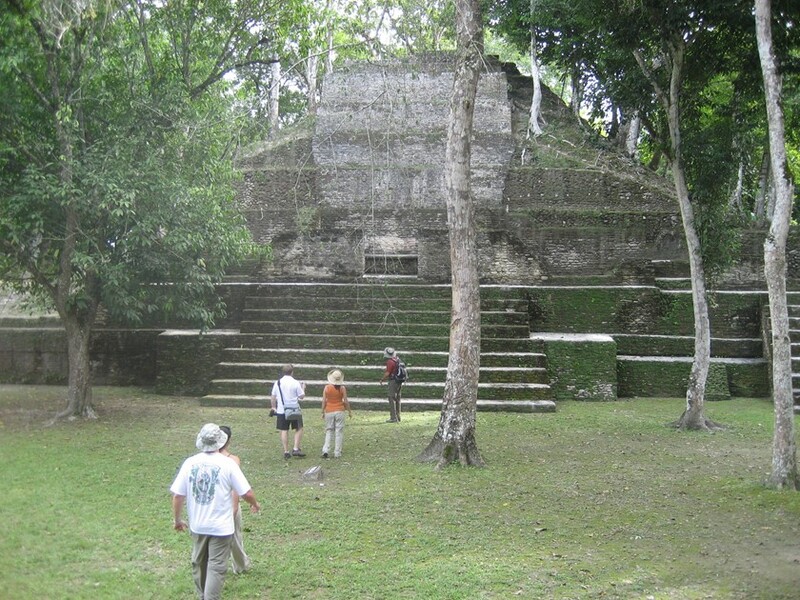 Our guide was of Mayan descent and was very informative. 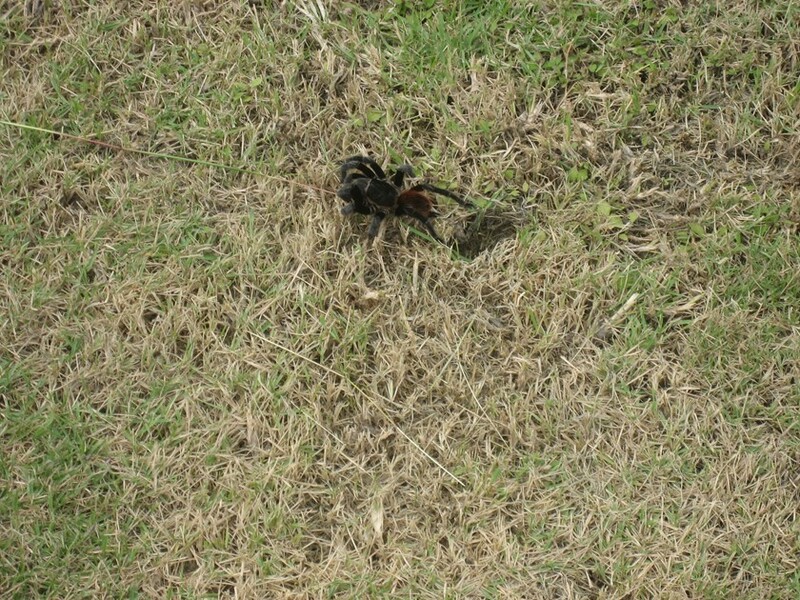 It was fairly easy for our guide to lure a tarantula out of his hole to greet us. Next, we prepared to climb to the top of the temple. The view from the top was nothing short of spectacular. 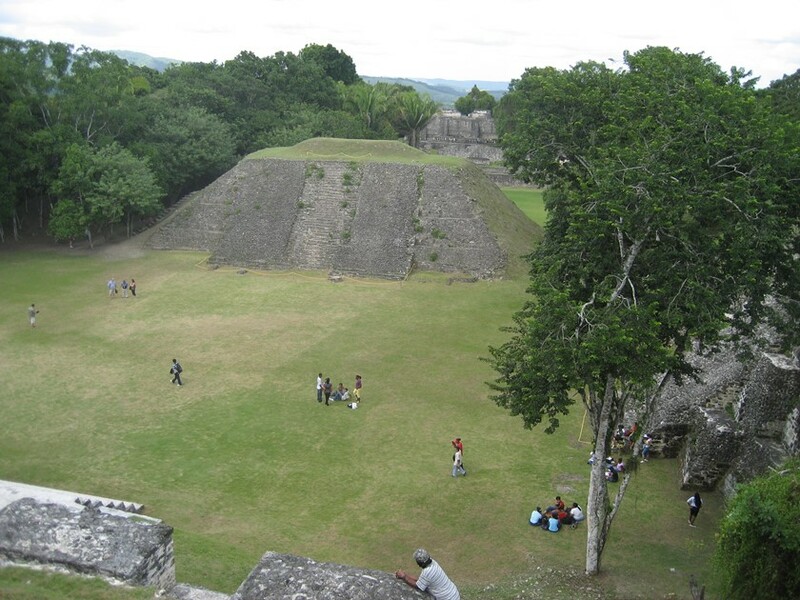 One got a perspective of just how impressive the Mayans had been to design and construct these sites. 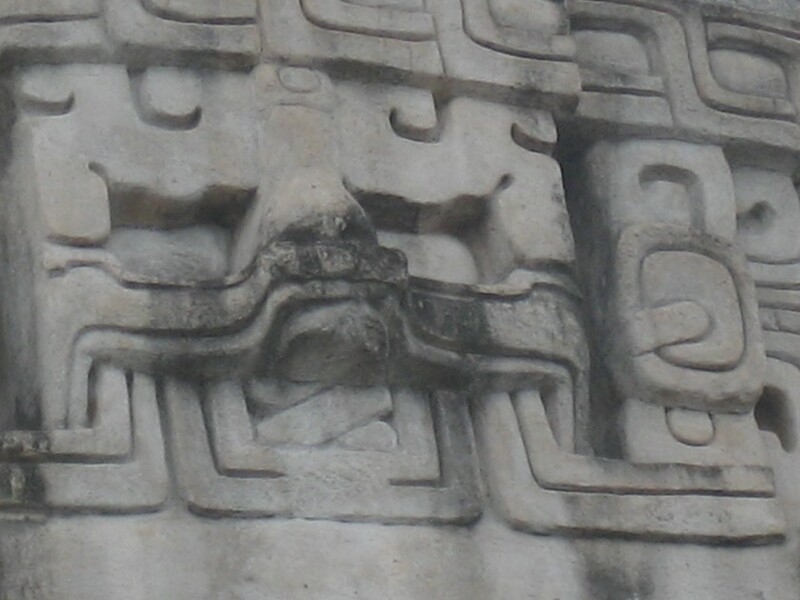 At the top of this temple archeologists had reconstructed some of the friezes they uncovered. 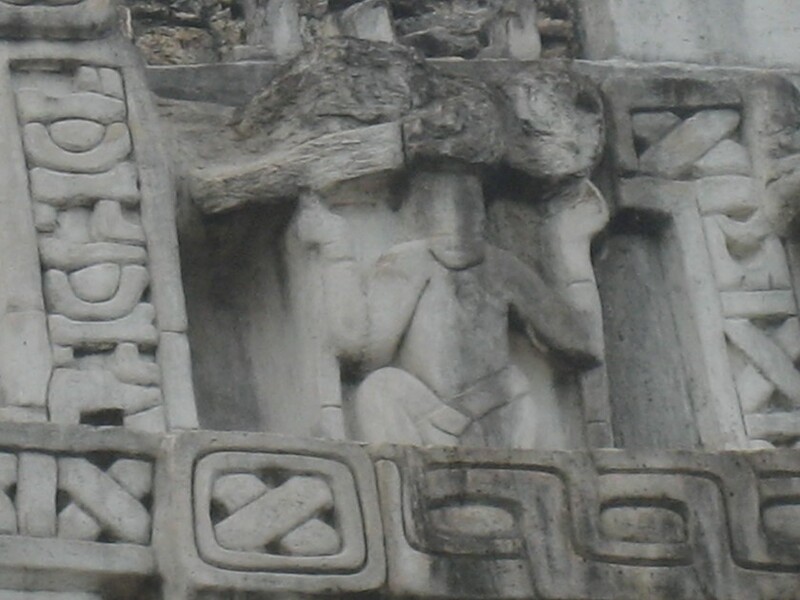 The picture below is of the Mayan version of Atlas holding up the world on his shoulders. 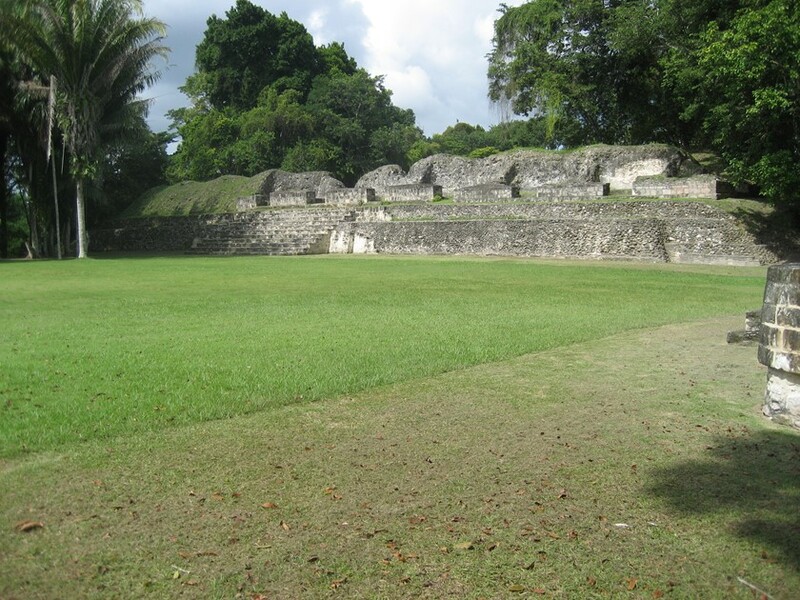 The site of these ruins is right on the border with Guatemala and there is reported continuous tension between the two countries. 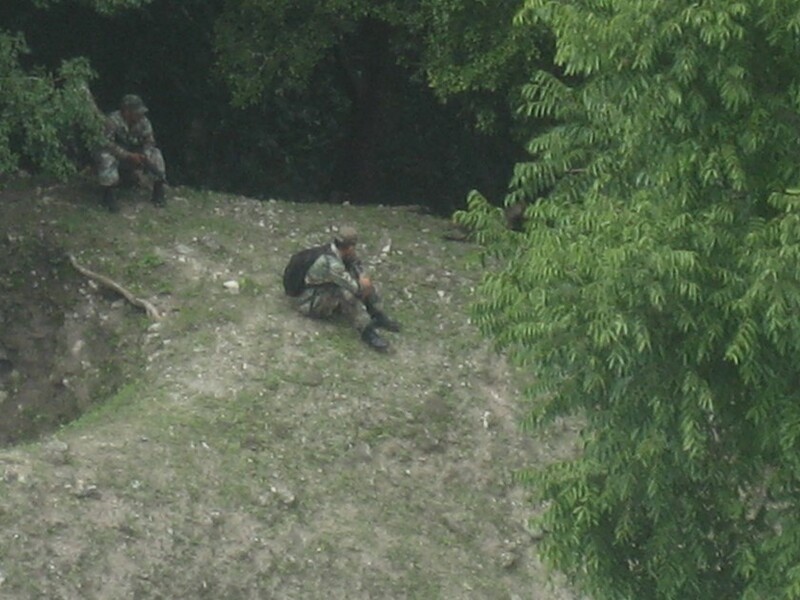 As you can see below, either to protect the site from further pilferage or to defend the border, there are Belizean Army personnel stationed at the sight. 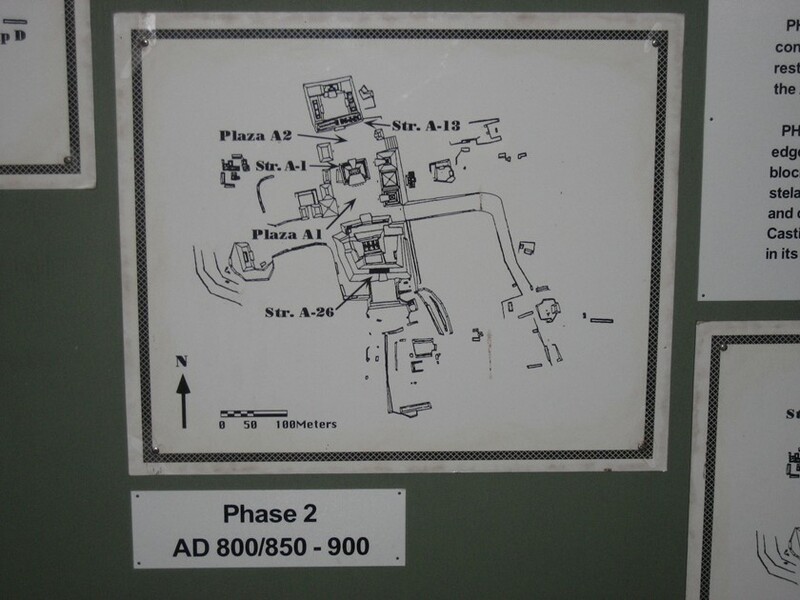 Our guide walked us around the site to show how much had not yet been excavated or explored. 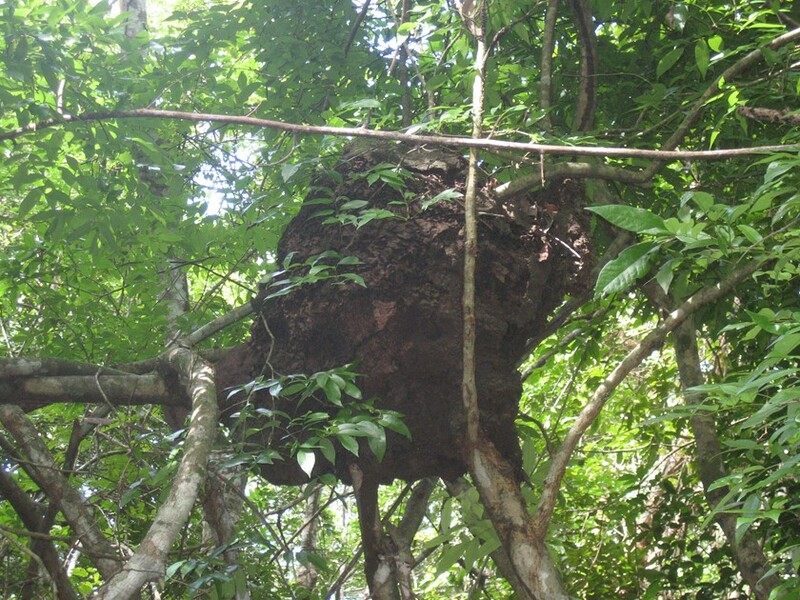 He showed us the termite home in a tree over our heads and invited us to pick a termite off the tree and eat it. I was a willing subject and can report they are quite tasty with a flavor not unlike a carrot. He also pointed out a few Howler Monkeys high in the trees but too distant for a good photograph. 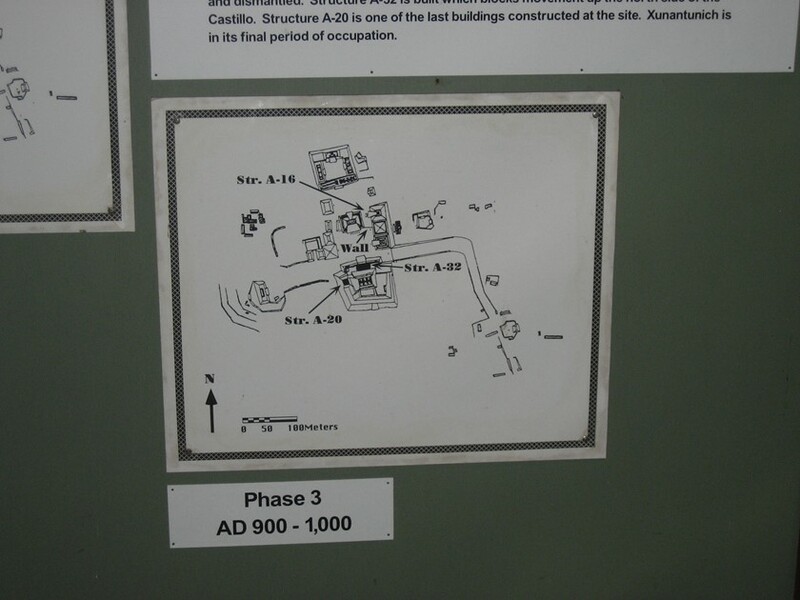 The Xunantunich site was constructed in a series of three phases, one on top of the other and each with a smaller footprint. We were fed a delicious lunch of fried chicken, rice & beans and coleslaw with cookies for desert. 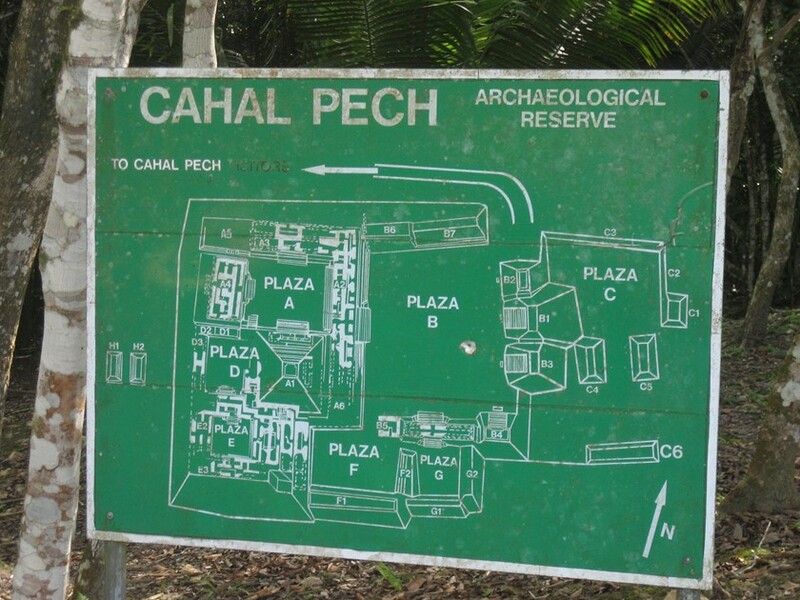 We then boarded the vans for a 30 minute ride to another Mayan site called Cahal Pech or House of Ticks. Once again, our guide was terrific. 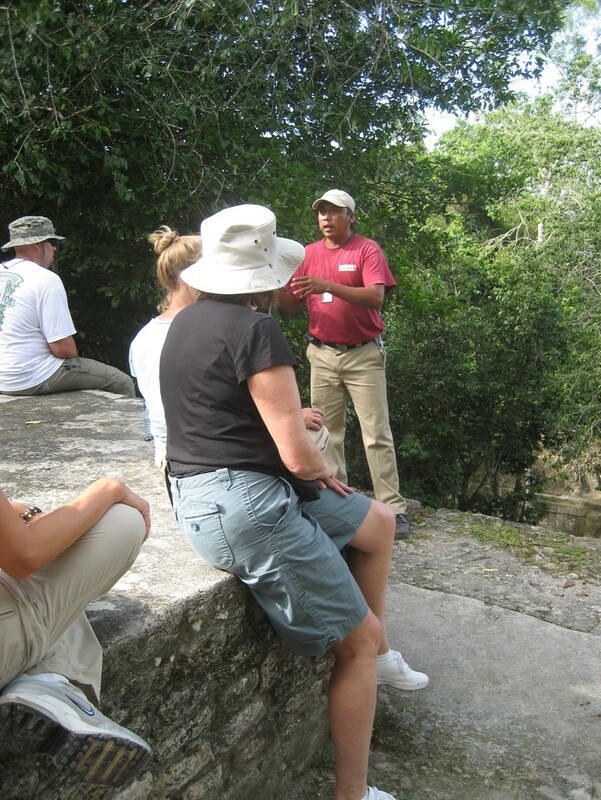 Pedro is of Mayan descent and spoke passionately about the beliefs and traditions of the Mayans. There were many buildings to examine but we spent the most time at the main field of celebration. Here the royalty were called to observe the traditions, rites of passage and sacrifices to the gods. We each took a turn seated in the royal box. 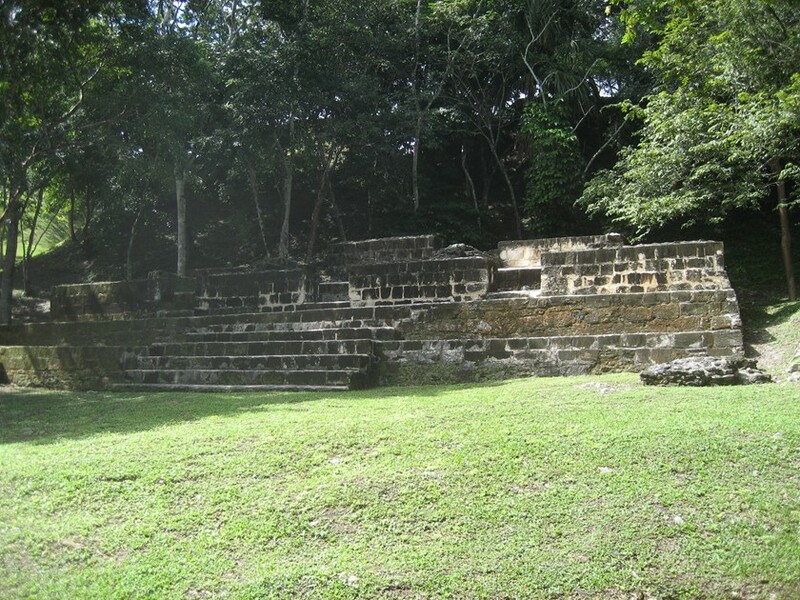 That ended our trip to the Mayan ruins. We then endured another 2 –1/2 hour drive back to our hotel. 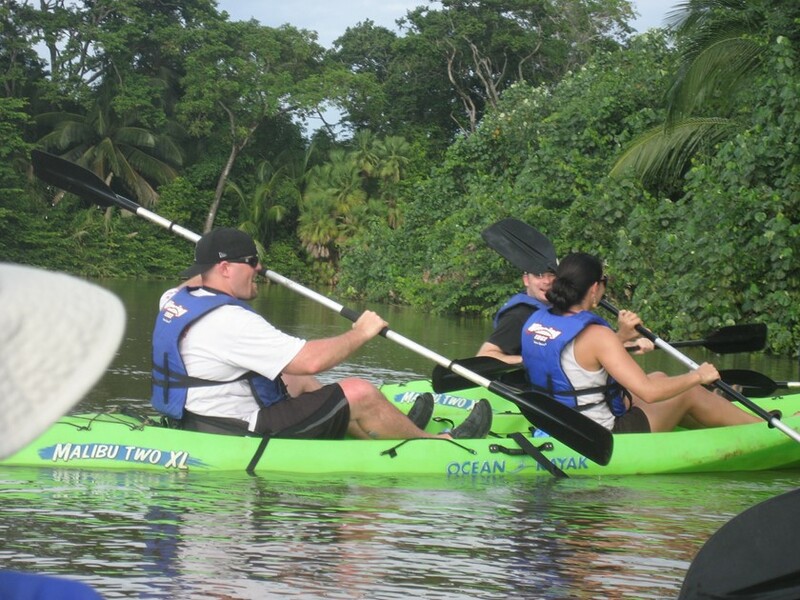 This is our last day in Belize for this trip and we chose to take it easy. 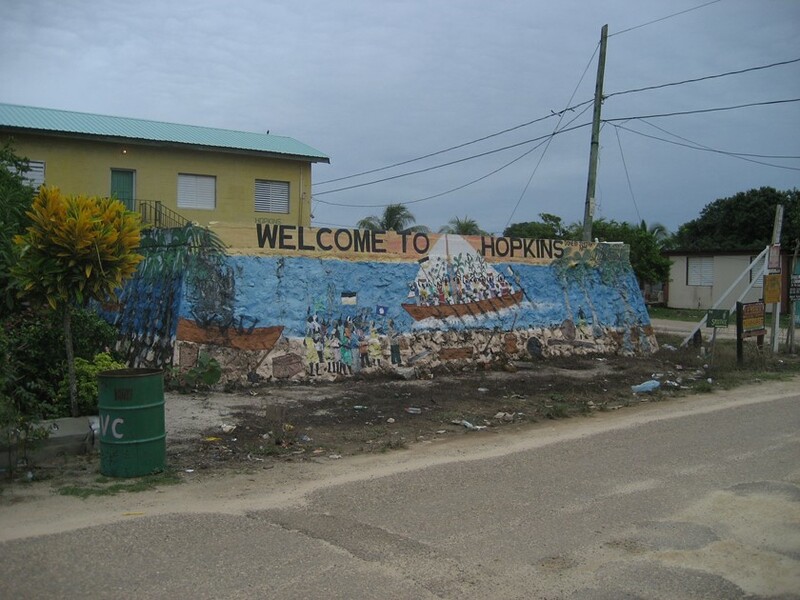 After a leisurely breakfast, we took bicycles and went into the city of Hopkins. Below is the wall in front of the Hopkins Police Station. Notice the old-style one-speed, fat tire bicycles. 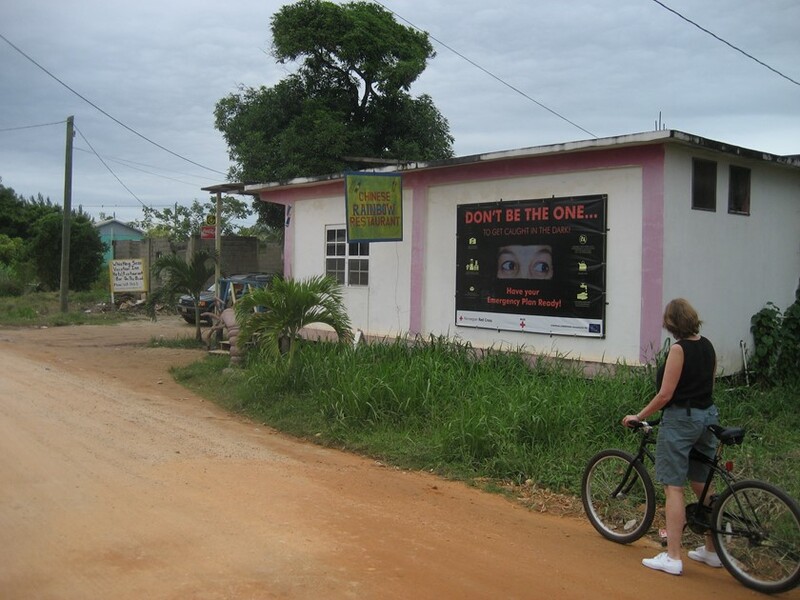 We paused in front of a poster encouraging everyone to be prepared with a ‘go kit’. Then we visited a true relic of the sixties. 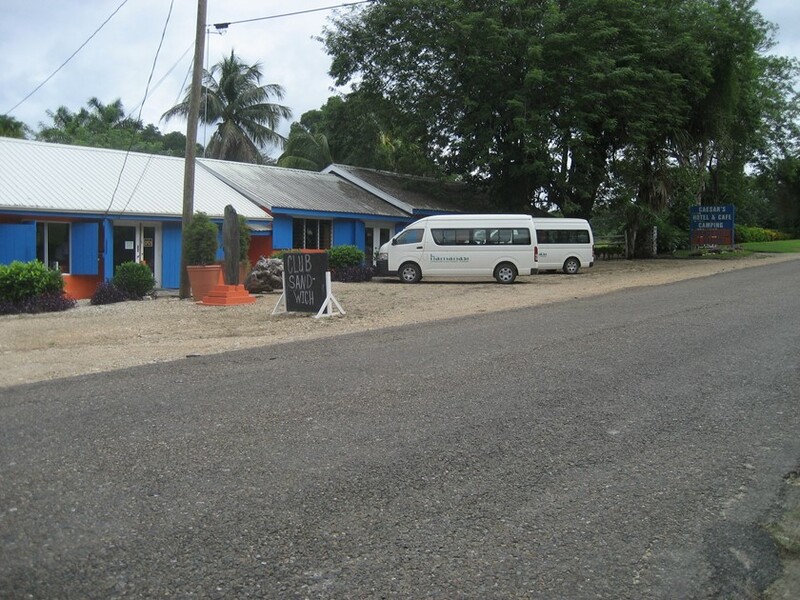 Here were people using a former school bus as a retail shop and living quarters. 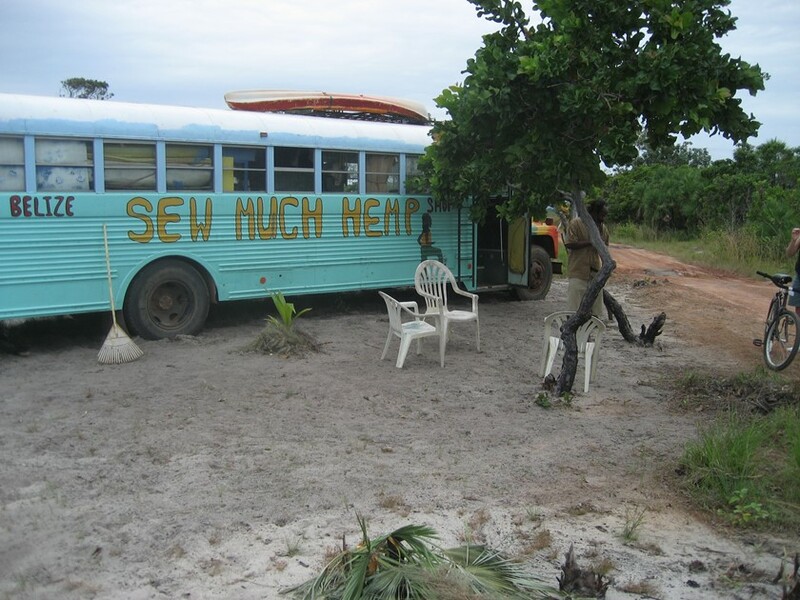 This was the “Sew Much Hemp” shop from which they sold various hemp-based remedies, wood carvings and other local crafts. We spent the rest of the day by the pool and began our trip back home on Sunday. This was our last day. Pat got up early and went for a long walk on the beach. I relaxed and read my book. 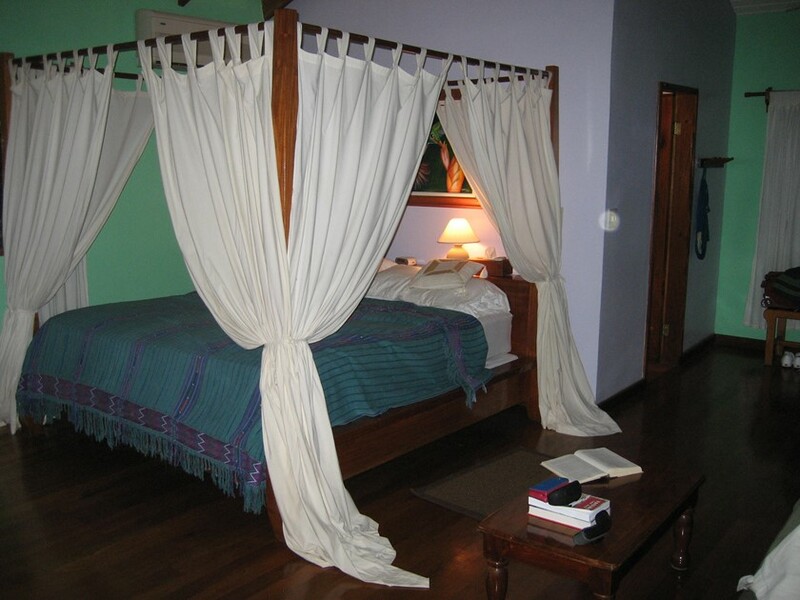 At 9:00 am we met in the hotel lobby with the other couple going to the airport, boarded the van and departed for the 45-minute ride back to the Dangriga Airport. We arrived on schedule at the passenger terminal. We were well ahead of the pilot who was nowhere to be found. 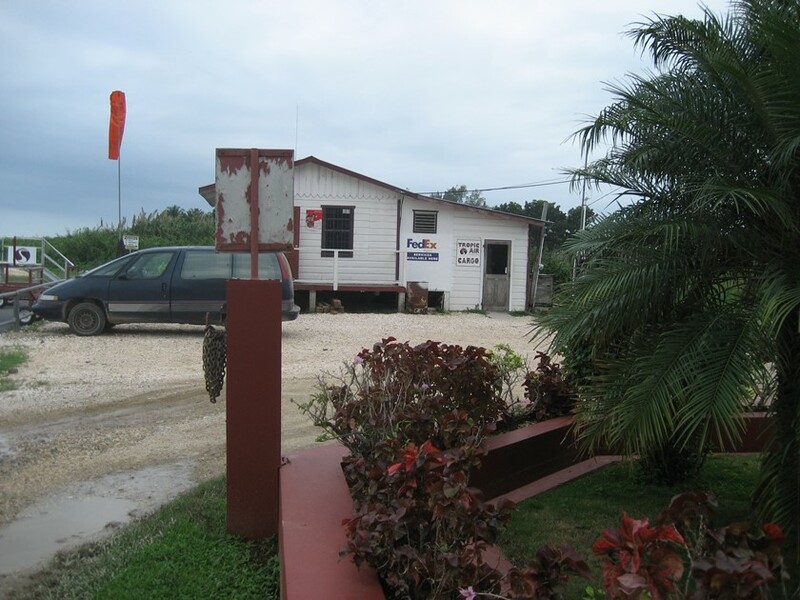 The airport even had a freight terminal. The plane was open and prepared for flight. But no pilot. 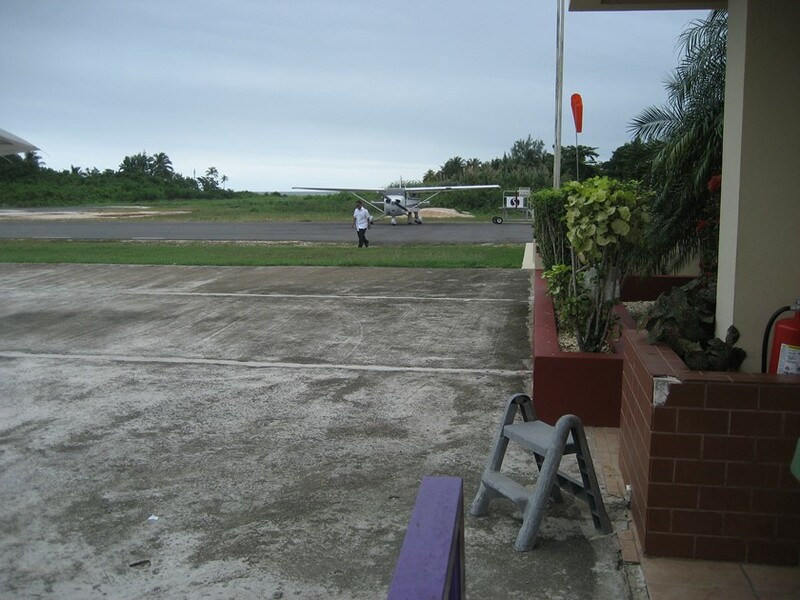 Off in the distance, I spotted a small Cessna 172 approaching the airport to land. This little plane, in fact, was flown by our pilot as his commute to work. 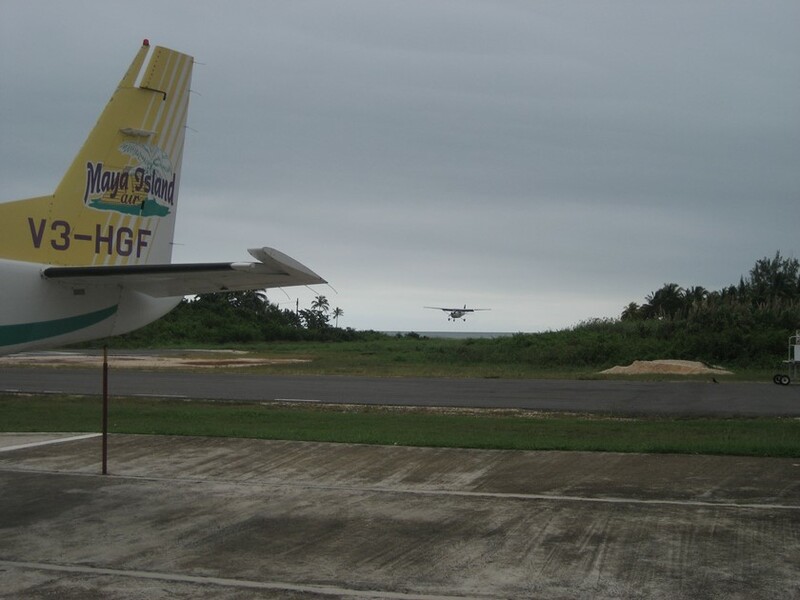 Sure enough, our pilot exited the Cessna 172 and sauntered over to our Cessna Caravan. With the VERY briefest of walk around inspections, we were boarded and took off almost immediately. 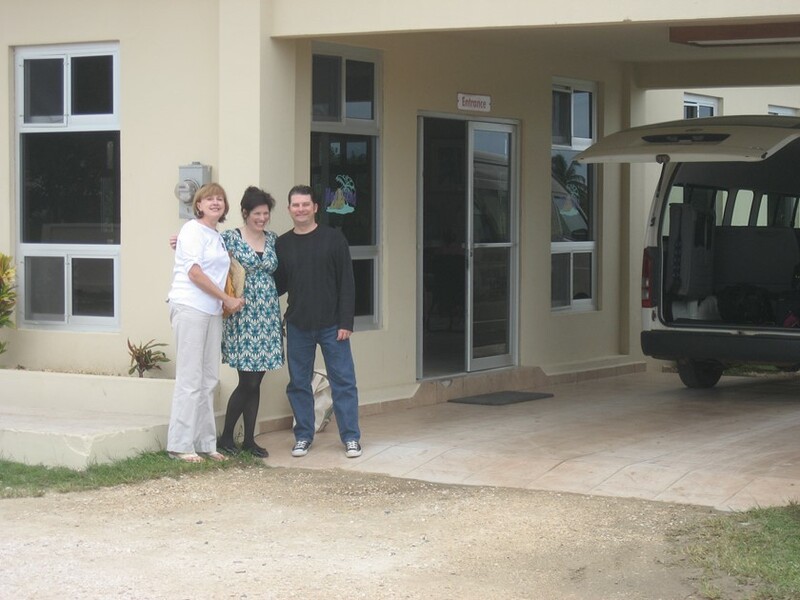 15 minutes later we arrived at Belize City airport and placed our lives back in the hands of American Airlines.